With AutomationDesk, tests can be executed 24 hours a day, seven days a week, letting engineers increase test coverage and improve ECU software quality while saving time and costs. AutomationDesk 6.0 now supports Python 3 as well as Version 2.1 of the ASAM XIL API standard. The test automation software now also includes its own Python interpreter. The interoperability of ASAM XIL API-compliant products, such as AutomationDesk, is checked on a regular basis. For this purpose, major vendors of development tools for automotive applications meet with dSPACE regularly to carry out so-called cross tests on their products. During these tests, they connect their test tools to third-party test benches to evaluate if their test software is able to communicate with test hardware from other manufacturers without issues. AutomationDesk 5.0 introduces signal-based tests, a new type of test description that is as easy to create as if it were written on a sheet of paper. Honda Aircraft Company develops a fully automated Advanced Systems Integration Test Facility to get its new business jet into the air in record time. Precise control of the cab temperature is the be-all and end-all of developing vehicle climate control systems. Bergstrom aims at reducing the time-consuming calibration of these systems by 80%. For this, the climate experts use a model-based approach with various dSPACE tools. This website provides a link list for fast access to the most important support information for Test Automation Tools. The training course covers the access to HIL platforms as well as a wide variety of tools: e.g., the Failure Insertion Unit, calibration and diagnostic tools, MATLAB®, and ControlDesk. The instructor will show you how to work with custom libraries filled with self-defined generic test steps and complete tests. You can gain hands-on experience in using predefined frameworks for your test implementation. 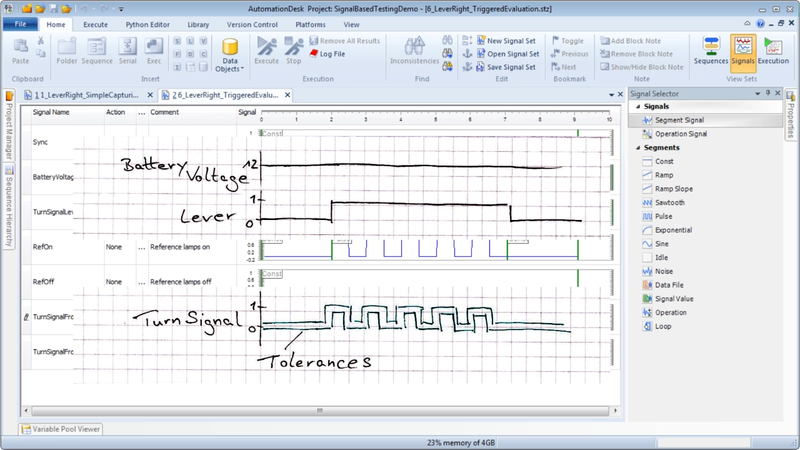 AutomationDesk is a powerful test authoring and automation tool for hardware-in-the-loop (HIL) tests of electronic control units (ECUs). 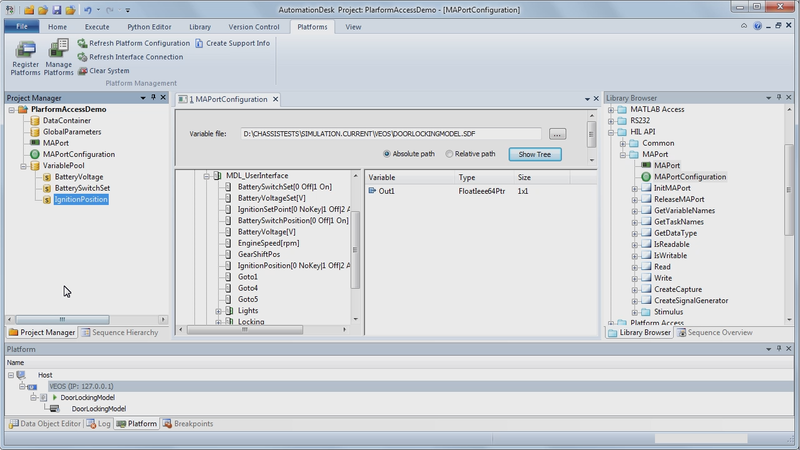 AutomationDesk makes it easy to access your simulation platform. 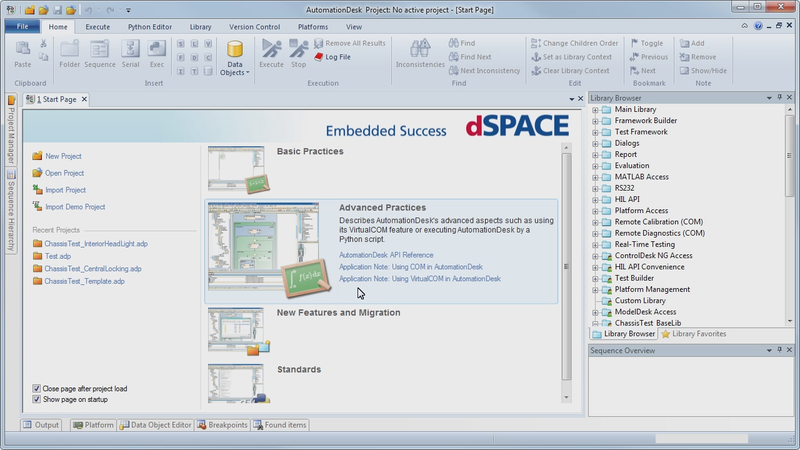 Accessing the simulation platform dSPACE VEOS with dSPACE AutomationDesk using HIL API. AutomationDesk is a powerful test authoring and automation tool for hardware-in-the-loop (HIL) testing of electronic control units (ECUs). AutomationDesk users can create and edit test routines in a graphical format without requiring programming skills. AutomationDesk’s interface libraries, compliant with the ASAM standards, allow for a seamless reuse of automated tests across different development stages, such as MIL and SIL simulation with VEOS, dSPACE's platform for PC-based simulation, and HIL simulation with SCALEXIO or any third-party simulation platform that provides a XIL API-compliant interface. 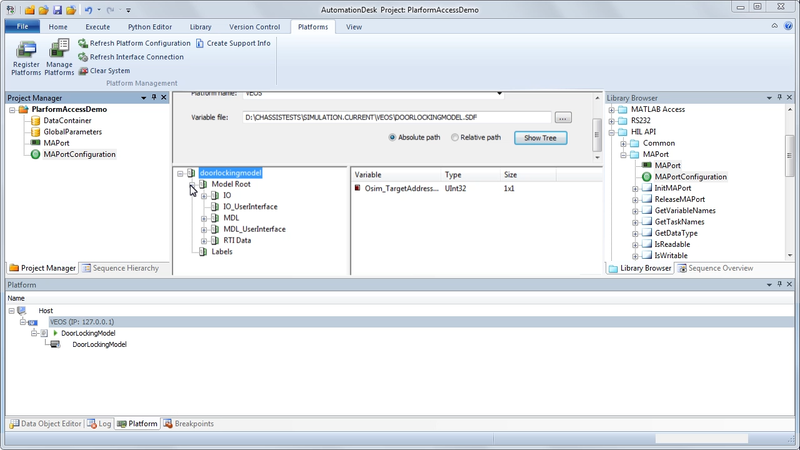 AutomationDesk provides libraries containing a large number of predefined test steps, e.g., for easy access to the simulation model, a Failure Insertion Unit (FIU), or calibration and diagnostics software. With AutomationDesk, tests can be executed 24 hours a day, seven days a week, letting engineers increase test coverage and improve ECU software quality while saving time and costs. AutomationDesk lets you describe test routines graphically, be it test-step-based test authoring based on library elements, or signal-based test authoring based on stimulus signals and evaluation of captured signals. Test Automation Software Overview: The modular packaging of dSPACE’s test automation software lets you select the packages you need for your automation tasks, and add other modules later on if necessary. The ASAM XIL API V2.1 standard is the next generation of the ASAM HIL API standard. The XIL Model Access Port (MAPort) supports test bench access in all stages of the function development process: MIL (model-in-the-loop), SIL (software-in-the-loop), PIL (processor-in-the-loop) and HIL (hardware-in-the-loop) simulation. The XIL Electrical Error Simulation Port (EESPort) in ASAM XIL controls electrical error simulation hardware. It lets you set various types of errors. The previously supported XIL 2.0.1 servers, can still be used in AutomationDesk. AutomationDesk can also integrate third-party tools, such as CANscope, CANstress, CANoe, and CANalyzer from Vector. Please contact dSPACE for details on supported third-party tools. dSPACE also has experience in connecting AutomationDesk to third-party hardware-in-the-loop systems, provided they support the XIL API standard properly, and offers engineering support on request. Implementation examples (e.g., VISA Access Library, AutomationDesk CANoe Library) can be found in the Test Automation Software Support Center.